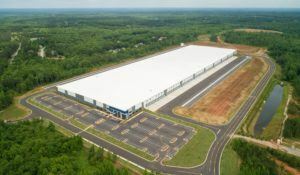 Atlanta and Newport Beach, Calif. – CT Realty and its affiliates have completed the first phase of development at Palmetto Logistics Park and announce a 1,054,500-square-foot lease to Drive DeVilbiss Healthcare, a global manufacturer of respiratory and ambulatory medical products that plans to take occupancy by the end of the year. Terms of the lease were not disclosed. CT and affiliate Port Logistics Realty partnered with River Oaks Capital Partners in a joint venture with Prudential Global Investment Managers to acquire the initial 213-acre parcel for Palmetto Logistics Park in 2017. The venture owns the underlying land for the second phase of the project, a 1,041,600-square-foot distribution facility that will commence development in January and is slated for completion in Q4 2019. The venture controls an additional 147 acres for two subsequent phases of development that will complete the 3.5-million-square-foot logistics park. A key feature of Palmetto Logistics Park is its superior location across the highway from a CSX intermodal facility and proximity to I-85. The park is also located 12 miles from the Hartsfield Jackson Atlanta International Airport. “Buildings that are strategically located near modern logistics infrastructure are integral to meeting the demands of today’s most progressive logistics users, which is at the heart of our national strategy,” said Rob Huthnance, CT’s partner responsible for East Coast development and operations, including the activities of PLR. Drive DeVilbiss Healthcare was represented by Jason Goldman and Bob Robers of Cushman & Wakefield, while the joint venture was represented by Ben Logue and Price Weaver of Colliers International. “This building meets the expansion needs of Drive DeVilbiss Healthcare and represents the high caliber of distribution facilities in demand throughout the region,” added Eben Hardie of River Oaks Capital Partners, CT’s partner in Atlanta. CT Realty is engaged in a strategic expansion to meet the significant global demand from e-commerce and logistics companies for large scale, Class A industrial buildings in nine Tier 1 markets in the U.S. Among other recent developments, CT recently completed the 1.7 million-square-foot, three-building first phase of NorCal Logistics Center, punctuated with a lease to Amazon for 1.1 million square feet and the sale of two buildings to Prologis. CT also completed a 16-building development program in multiple projects in Southern California’s Inland Empire with PGIM in 2018. CT is also nearing completion on 1.3 million square feet of large-scale distribution buildings in the first phase of Interchange 55 Logistics Park in the greater Chicago area, and is in development on logistics centers in Indianapolis, Dallas/Fort Worth and New Jersey. The company’s current land holdings now support the development of roughly 24 million square feet of industrial buildings over the next five to seven years, and CT is actively seeking additional land holdings nationwide.